- This quest has kind of an odd trigger. In order to get it started you need to head to the National Guard Training Yard. It’s located in the northeast of the map, almost directly east of Lexington’s icon. (Though quite a ways away.) 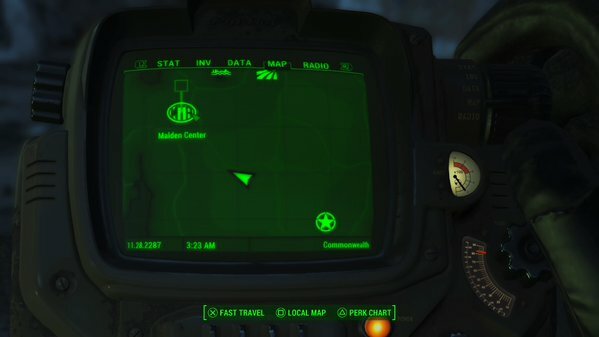 You’ll be sent there if you accept the Minutemen job Ghoul Problem at Greentop Nursery. Once there you’ll receive a distress signal on your radio. - Inside the Recruitment Office, after fighting off a bunch of Ghouls, you’ll see several ways to go. On your right is a room with the corpse inside. Entering the room will trigger the quest. Strip the corpse of the Knight Astlin Holotape and Holotags, and, if you want, steal the pulse transmitter sending out the distress signal. - Head to the Cambridge Police Station once you’re a member of the Brotherhood of Steel and speak to Paladin Danse. He’ll talk about a patrol that went missing and suggest you search for clues to their whereabouts near Malden. There’s a good chance you found Malden on the way to the Training yard, as it’s located a short trip west of Greentop Nursery. Once you head towards Malden from the Nursery you’ll get wind of the distress beacon. Put it on the radio to follow the signal. - The signal originates from a small, busted-up house southeast of Malden Center on the map. (Check the image above for a more exact location.) The house contains a radiation pit, an Advanced safe with a variety of items, an ammo box beside the safe containing four Fusion Cores, and, down in the pit, four suits of burned-out Power Armor. On the side of the pit is a corpse for a Knight Varham, carrying, among other things, a Battlefield Holotape and Knight Varham’s Holotag. Listen to the Battlefield Holotape to complete the requirements. - Next up is the Revere Satellite Array. Located within sight of the National Guard Training Yard, a short jaunt to the east, the Satellite Array has more to it than just the distress signal. It’s quite dangerous. 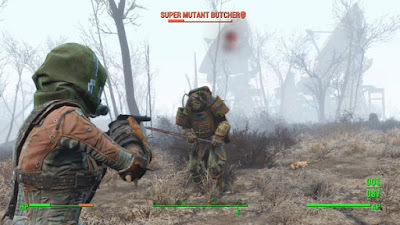 Fighting a hobbled Supoer Mutant Butcher in Fallout 4. There are lots of these 'round the Array. Hide! It’s not easy, but you can sneak onto the grounds by crouching low and slinking around. If you give the Array a wide berth you can find a hole in the fence around the southeast corner. Slip in here and climb up onto the nearest Array. The corpse you’re looking for - and the Scribe Faris’ Holotape and Holotag - are in the shack partway up. Outsource! If you've visited the Robotics Disposal Ground you can find a Combat Sentry that will happily roll over to the Revere Satellite Array and attack for you. 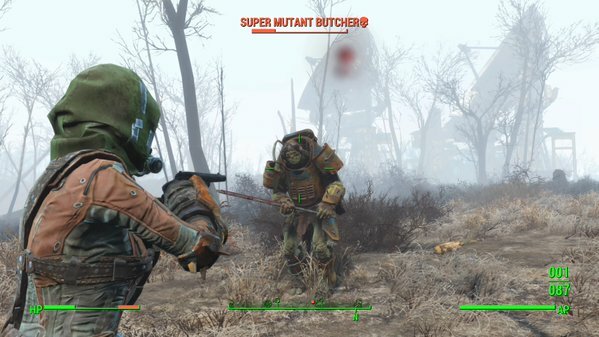 It's probably not enough to kill the Super Mutants on its own, but it's one hell of a distraction. This article has more details. - If you manage to clear out the Array - or if you’re incredibly sneaky - you’ll find a ton of ammo in the various ramshackle huts and damaged trailers spread about the place. Atop one of the satellite arrays (the one that is missing its dish) you can also find a U.S. Covert Operations Manual, and atop another (the northern-most one that isn't missing its dish, and expect some hairy climbing up terribly rickety wooden steps) you'll find a trunk full of goodies, a Fat Man, and stripped-down - but functional - Power Armor. Don’t miss out on the quest items above, as well. - Listen to the Scribe’s Holotape. It will add a new place to the map, assuming you completed the previous fetch quest as well: Recon Bunker Theta. You’ll find the Recon Bunker to the north of Greentop Nursery, on the veeeeeery edge of the map. The Bunker’s off to the side of the road. Inside you’ll find Paladin Brandis, who was mentioned several times during the Holotapes. Having collected the Holotapes you can not only get Brandis to lower his gun, but, with the Holotags, you’ll earn his respect. 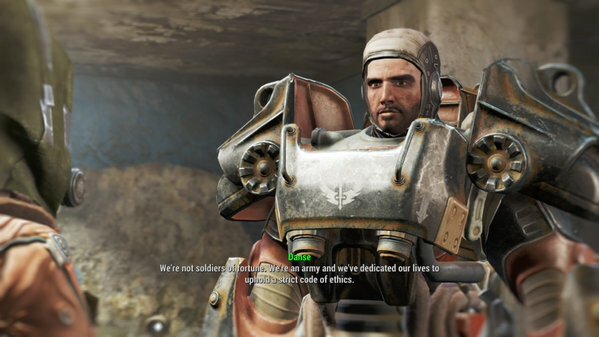 If your Charisma is high enough you can convince him to rejoin the Brotherhood of Steel, which will later earn you his gun. (Or you can just kill him now.) Either way, you can take whatever you like from the Bunker, including Paladin Brandis’ Holotape. Pop back to Cambridge Police Station. You can tell as much or as little as you want to Dance, including passing over the Holotapes you found. Either way, you’ll get your reward from him.